In a remote corner of the campus of Columbia University, in a wing of a building overlooking Amsterdam Avenue, is a place where most might not suspect all the Black history magic happens. But once you enter the Schermerhorn Extension, there’s no mistaking you are in some place special as headshots of writer/researcher Zora Neale Hurston and scholar Franz Boas, graduate anthropology student and anthropology educator, greet you from behind a glass case. This building is home to Columbia’s new African-American and African Diaspora Studies Department, formally created in December, as well as Columbia’s Institute for Research in African-American Studies. The department will now be the formal umbrella for courses and educators who have operated throughout disciplines and throughout the school. The institute will continue to operate as a connection to the public and to public issues, much like The Hutchins Center for African & African-American Research at Harvard University headed by Dr. Henry Louis Gates Jr.
Dr. Farah Griffin, who is wearing two hats as the inaugural chair of the new department and director-elect of the institute, has hit the ground running. She has plans to create an endowed chair named for the late Dr. Manning Marable, the historian who founded the institute. She also is working on a conference slated for April focused on the 400th anniversary of the first Africans who came to the United States, in Jamestown, Va.
She says it’s an important time in history for Columbia to assert itself when it comes to issues of diversity, a time in which the U.S. President is insisting on the construction of a wall to keep out migrants from Mexico; when photos are surfacing of public figures wearing Blackface and Black people dying in incidents with police. Griffin’s position is a dream come true for someone like her who fell in love with reading and learning early on, so much so that her brand so to speak includes literature, music and several other disciplines. The educator says her love for soaking up all she could about the world around her came from her childhood in Philadelphia, a place overflowing with American history and with Black history and culture. When Griffin went on to become an undergraduate at Harvard, the people who taught her noticed that she seemed to love to bury herself in learning, so they encouraged it and planted the idea in her head that she might excel at a career in academia. “It was my professors in college who sort of opened my eyes and made me think, ‘You know you could actually do this for a living,’ and I thought, ‘Oh, that’s so self-indulgent to do what I love for a living,” she adds. 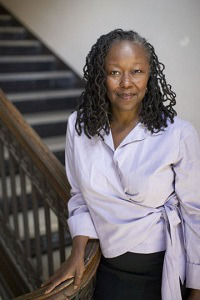 Scholars on campus like the late historian Dr. Nathan Huggins made sure they introduced Griffin to any Black women scholars who came to Harvard’s campus, and her professors encouraged her, clearing the way for her to organize a conference on the emerging field of Black women’s studies. It was a major move, considering the fact that the late Eileen Southern, a Black musicologist, was the only Black woman arts and sciences professor at Harvard, says Griffin. The conference included mavericks, like writer/historian Paula Giddings and literary scholar Mary Helen Washington. The experience whetted Griffin’s appetite for more. She was to get just that when she went on to Yale University – then home to political scholar Dr. Cornel West, author/feminist Dr. bell hooks and the late slavery historian Dr. John Blassingame – to pursue a doctoral degree. Now that she is at Columbia, Griffin recognizes that her roles put her at a crossroads of a university in Harlem, the most well-known historically Black community in the country, and a university that sometimes struggles to make that relationship smooth, at a time when the national political scene is racially tense and in which people appear hungrier than ever for racial clarity. During a recent conversation in her office, Griffin marveled that filmmaker Spike Lee was able to showcase footage from the 2017 fatal attack at the racially tense Unite the Right rally in Charlottesville, Va., at the end of his Oscar-nominated film, “BlacKkKlansman”, in a way that made it appear as if it were something happening in years past when the country was reportedly not as advanced. Even her students, she says, are able to make similar connections when studying incidents in history such as the Wilmington, N.C., race riot of 1898 and comparing the conditions that led up to it to conditions today. She often explains to her students the roles that demagogues and the press played in such situations. Griffin, who lives in Harlem, says that she and her husband – Dr. Obery M. Hendricks, Jr. – a well-known biblical scholar, frequently drive upstate just to clear their heads. With everything happening in the country and with another White House election looming, she envisions that the department and the Institute will continue interacting with the community in terms of politics and other issues. For instance, as the midterm elections approached last year – elections that both parties saw as crucial – the school hosted a public conversation with Dr. Christina Greer, a frequent political commentator on television, to discuss the ramifications of the election. 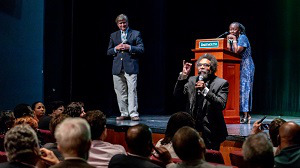 The plan is to bring scholarship to as broad an audience as possible and to let the surrounding community in Harlem know that Columbia intends to be a good neighbor, Griffin explained. “I think it just goes to show how we are still in need of the kind of work, the kind of analysis, the kinds of discussions that departments like this make possible and that in fact it’s even of why that work needs to be even more widely distributed, to show people that it’s not an anomaly, there’s a long history to a lot of this,” she says. Dr. Imani Perry, a professor at Princeton University who studies race and culture, says that Griffin is an ideal fit for the dual role at Columbia.